The animated maps below are fascinating, but of course there’s lots of important caveats regarding the data. Since 1986, the Australian Bureau of Statistics (ABS) has calculated Socio-Economic Indexes For Areas (SEIFA) based on five-yearly census data. These include indexes of relative socio-economic disadvantage (IRSD), and – since 2001 – an index of relative socio-economic advantage and disadvantage (IRSAD). For 2006 and 2011, SEIFA was explicitly designed to measure “people’s access to material and social resources, and their ability to participate in society” (with similar intent for prior years). This post looks at the spatial changes over time in these index values. I must be upfront: ABS explicitly cautions this type of analysis. This is mostly because the component census variables that make up SEIFA scores and their respective weightings vary between each census, but also because statistical area boundaries change, the number of areas has increased, and indexes were calculated on usual residents from 2006 onwards (as opposed to people present on census night for 2001 and earlier). ABS also notes that middle range scores are very similar, so time-series analysis should focus more on the top and bottom ends of the spectrum. More discussion on this issue is available from ABS and .id consulting. Excessive caution may mean that we never do any interesting analysis! This index has been available from 1986 onwards. check the SEIFA documentation for full details. Click on this map to enlarge and see an animation of IRSD percentile values for the years 1986 to 2011. Most inner city suburbs have gone from being some of the most disadvantaged to much less disadvantaged. It’s hard to imagine suburbs such as South Yarra and East Melbourne as being highly disadvantaged, but the data suggests that was the case in the 1980s. During this transformation, pockets of high disadvantage have remained, probably reflecting older government housing estates. There appears to have a been a fairly large change between 1986 and 1991. This could represent dramatic demographic change and/or reflect changes in the calculations of SEIFA index values. Areas with the highest disadvantage have generally shifted away from the city centre (including some middle suburbs such as Carnegie), perhaps reflecting the growth in high-end CBD jobs driving the attractiveness of near city living. New urban fringe growth areas often begin with low levels of disadvantage, but have become more disadvantaged over time. This is particularly evident in areas such as Hoppers Crossing, Werribee, Melton, Deer Park, Craigieburn, Keysborough, Karingal, Epping, Hampton Park, Cranbourne, Altona Meadows and Keilor Downs. Perhaps this is because when these areas were initially settled there were many double-income-no-kids households that now have more kids and less income? It could also be a reflection of a turnover in the resident population. The maps only show geographic units with a population density of 5 per hectare or more, so you can also see the urban growth of Melbourne (more on that in a upcoming post). This index was first calculated in 2001 and aims to also measure advantage, not just factors that suggest disadvantage. In 2011 it included all but one of the IRSD variables, plus a number that describe levels of advantage (eg high income, higher education, occupations such as managers and professionals, high rent or mortgage payments, spare bedrooms). Again, check the SEIFA documentation for full details. An aside: SEIFA associates higher car ownership with advantage, but I suspect some inner-city types might consider not needing to own a car an advantage. 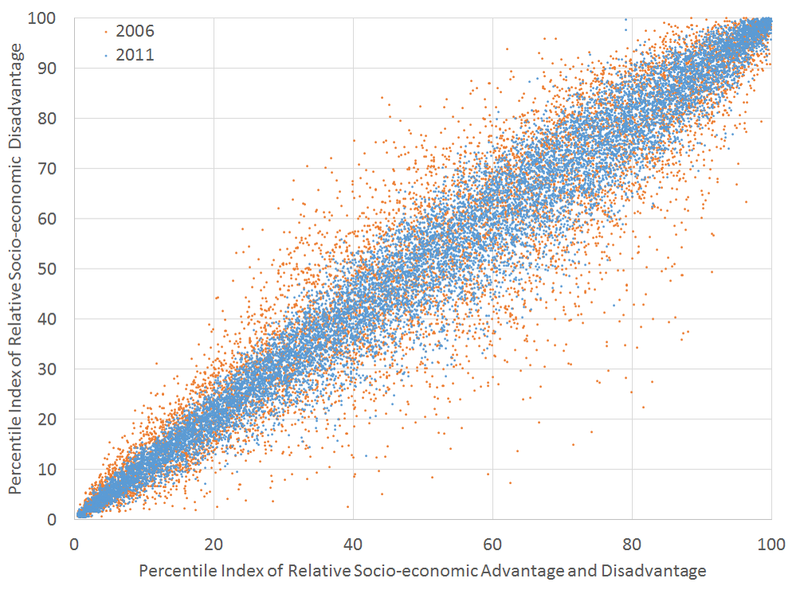 Here is an animation of the Index of Relative Socio-economic Advantage and Disadvantage for years 2001 to 2011. Again, click to enlarge and see the animation. The Melbourne CBD drops in 2011 – possibly because of a change of demographics (more students?) and/or a change in the component variables. Many parts of the middle eastern suburbs (particularly the Whitehorse area) appear to drop from the upper to the middle percentiles in 2011. How different are IRSAD and IRSD values? IRSAD contains a lot more variables and uses different weightings. See the ABS website for full details. You can see the relationships between the two indexes is stronger in 2011 (R-squared = 0.96) versus 2006 (R-squared = 0.89). This might reflect the make up of the variables in each year and/or the smaller geographic units in 2011 (SA1s) which may reduce diversity within each geographic unit. I’m sure others could spot other interesting patterns, and/or offer explanations for the changes over time (comments welcome). This entry was posted on Sunday, September 29th, 2013 at 10:48 pm and is filed under Melbourne. You can follow any responses to this entry through the RSS 2.0 feed. You can leave a response, or trackback from your own site. Unfortunately the SEIFA data for 2016 won’t be released until 2018.